Indulge your senses with modern refinement adorned with vibrant delight! 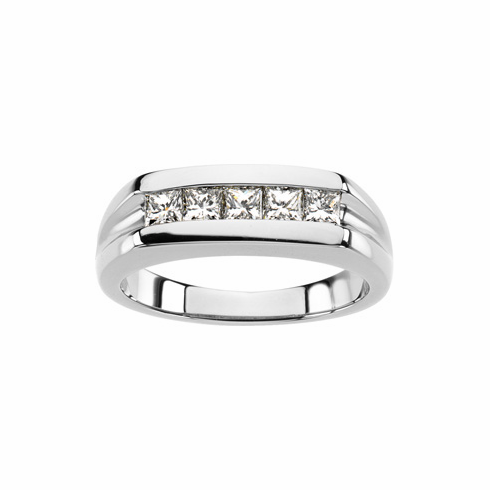 Crafted in platinum, this opulent man's platinum ring features five princess cut3mm diamonds in channel settings. This man's platinum and diamond ring has diamonds that are G-H in color and SI1 in clarity. 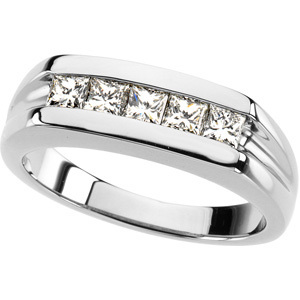 The total diamond weight is approximately 7/8ct. The platinum mounting weighs 13.39 grams. Platinum jewelry stands for the best there is! It is the choice of celebrities, royalty and the American bride to be. Platinum has an illustrious history. A metal with a long and rich heritage in equal parts mysterous, enchanting and surprising. More than 70% of the platinum mined is used for medical, industrial and electronic applications, creating a high demand for this rare metal. Platinum is a metal with which you can feel the difference. 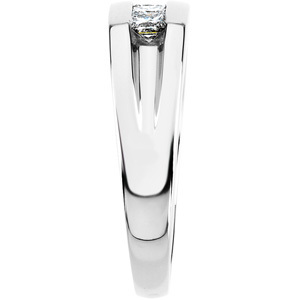 Platinum's hft conveys richness, luxury, quality and authenticity. Platinum is a diamond's best friend. Nothing protects a diamond like the strength and durablity of platinum. Platinum develops a warm patina over time. 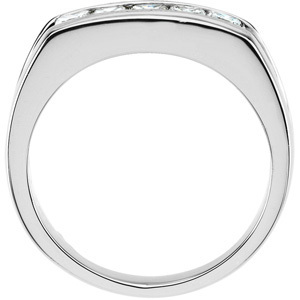 Enhance the aging beauty of platinum, because, in a sense, it captures the history of its wearer. Working and designing platinum requires more skill. Pride in workmanship translates into pride of ownership. Each scratch in platinum merely displaces the metal, and work hardens the surface to make it stronger, which makes any platinum jewelry an heirloom.